Aquatic invasive species (AIS) (aka 'introduced', 'invasive', 'exotic', 'alien', 'aquatic nuisance species (ANS)' include organisms transported to new marine, estuarine, and freshwater environments through various human activities. Introductions of nonindigenous AIS have dramatically affected many West Coast ecosystems. Studies have shown that large areas of the San Francisco Bay-Delta, for example, are dominated by more than 250 AIS, and that a new AIS is established in the system every twelve weeks (Cohen and Carlton, 1995, J.T. Carlton, personal communication, 2005). 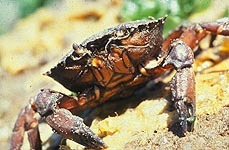 Documented impacts of AIS introductions include: 1) ecological changes, such as alterations to food webs and displacement of native species, 2) economic costs of removal and management of AIS, and 3) public and ecosystem health concerns from exposure to exotic pathogens (National Research Council, 1996). West Coast estuaries may be particularly susceptible to the introduction of new species due to their relative geologic youth and low species diversity (Herbold and Moyle, 1989). Ballast water in transoceanic ships is a major vector for the introduction of AIS to estuaries throughout the world. Ballast water is an essential part of normal ship operations, providing trim, stability, propeller immersion, and maintaining safe levels of hull stresses in various states of loading. 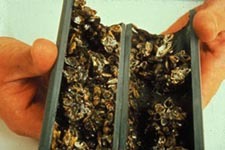 As ballast water is adjusted and flushed into the waters of destination ports during loading and unloading, organisms in that water are also released into the ecosystem. Research by Carlton et al. (1995) and others indicates that ships may carry 200 or more species of plants and animals in their ballast water at any given time, and commercial shipping accounts for one to three-quarters of introductions in North America (Fofonoff et al. 2003). Advances in shipbuilding technology have created larger and faster ships, which in turn, have increased survival rates of transported species between regions. Coupled with this has been a long-term steady increase in global shipping, such that today, more than 35,000 vessels are at sea at any given time. These facts may account for the almost exponential increase in observed species introductions during the past 200 years (Ruiz et al. 2000). In the year 2000, for example, 2.1 million metric tons of foreign ballast water was discharged into the San Francisco Bay-Delta (Falkner, 2001). This input of foreign ballast water presents significant opportunity for new AIS to invade, and once a species is established in a new area it is very difficult to manage and nearly impossible to eliminate. Once AIS have been introduced, they can be spread by several vectors, including recreational boaters and fishers. Read the short Guide to Preventing AIS Spread to find out how to prevent the further spread of AIS.